HOLLYWOOD – “It smells like you guys are having a good time,” guitarist Lindsey Buckingham yelled into the sold-out crowd of nearly 20,000 at the May 25th Fleetwood Mac concert at the Hollywood Bowl. Indeed, it was clear that many boomers decided to relive their high school and college days as the smell of pot wafted through the amphitheater onto the stage. Opening with the one-two “Rumours” punch of “Second Hand News” and “The Chain,” the band wasted no time diving into essential hits that the audience had come to hear, while still trotting out enough deep cuts, such as “Sisters of the Moon,” and “Eyes of the World,” to satisfy the most ardent of longtime Fleetwood Mac fans. In doing so, the band – Buckingham, singer Stevie Nicks, drummer Mick Fleetwood and bassist John McVie (as well as five well-utilized background singers and musicians) – pulled off the nifty feat of performing material steeped in nostalgia while never feeling like a nostalgia act, even though it’s been 25 years since the band’s last top 20 hit. Perhaps that is because a well-crafted, barbed break-up song – and let’s face it, Fleetwood Mac wrote some of the best ones ever – never really goes out of style. But credit also goes to the band’s commitment to deliver the songs in the freshest, most appealing way possible. Sometimes, that meant performing them with arrangements faithful to the 35-year-old studio original. Other times, it meant reinventing them as something different from the well-known FM radio staple, such as a trippy, extended “Gold Dust Woman” or the radically revamped “Never Going Back Again,” which now plays out as a dirge-like wistful tale of regret. Buckingham served as the group’s undisputed ringleader. He was the only one of the four on stage for the entire almost 2 1/2 hour show. It was his kinetic energy that drove the evening, and his brilliant finger-picking guitar style lit up the night. Often, after navigating through a particularly tricky, taut guitar solo that seemed to possess his whole body, such as the one that concluded “I’m So Afraid,” Buckingham would stomp his feet, scream “Yeah!” out loud and clutch his guitar as if still trying to dispel any remaining demons. If Buckingham is the group’s engine, Nicks is still clearly the heart. 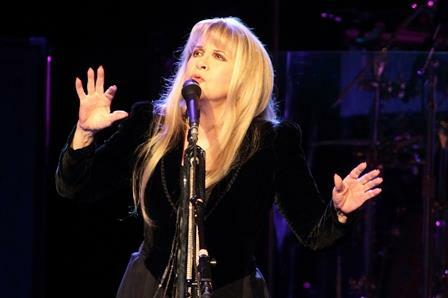 Dressed in a black velvet dress, black leggings and high heels, she still twirled right on cue during “Gypsy” and delivered a forceful “Stand Back,” from her 1983 solo album, “The Wild Heart.” Her voice still appealingly ragged and dusky, Nicks seemed to lose her place during “Rhiannon” early in the set, but then regained her focus and her vocal strength for the rest of the evening. Throughout, Buckingham and Nicks played into the mythology of their romance. Though its bitter end was chronicled on “Rumours,” more than three decades later the two still seem enchanted with each other, hugging each other onstage warmly, Buckingham holding and kissing her hand after the two performed a beautifully delicate “Landslide” together, and coming onstage for the encores holding hands. Buckingham’s three new songs on the recently released “Extended Play” EP, including “Sad Angel,” which the band performed, are even reportedly about Nicks. The intensity, whether real or for show, is so evident that when Buckingham thanked his wife and their three children in the audience, it felt like an intrusion; like a bubble bursting for anyone still invested in the fractured fairy tale that Buckingham and Nicks still indulge in. In a show that covered a wide terrain, the only obvious missing pieces were the songs made famous by Christine McVie – who left the group 15 years ago – such as “Over My Head” or “You Make Loving Fun,” but the band wisely left them on the shelf instead of trying to re-imagine them. Earlier in the evening, Buckingham talked about how this tour came more than three years since the last one. For fans who already await the next one, Buckingham soothed their concerns: “I think it’s safe to say there are still a few chapters left in the book of Fleetwood Mac,” he said. From the crowd’s wildly enthusiastic response to that remark and to the evening in general, it’s safe to say that book will continue being a best seller.